Is It Okay to Drink Caffeinated Beverages During Chemotherapy? Chemotherapy is a type of cancer treatment that targets and destroys cancer cells. The numerous kinds of chemotherapy drugs are each tailored for certain types of cancer and each associated with certain side effects. You may have to alter your diet while receiving chemotherapy treatment. Caffeinated drinks like coffee are a suitable beverage choice for some people during chemotherapy, although it is important to talk to your doctor regarding dietary guidelines or restrictions for your specific medical condition and treatment. According to the University of Pittsburgh Cancer Institute, it is important to increase fluid intake when receiving chemotherapy treatments. To avoid dehydration during cancer treatments, drink at least eight 8-ounce servings of liquid per day, the American Cancer Society recommends. Good fluids to keep you hydrated during chemo include water, juice, milk and caffeinated beverages such as coffee, tea and cola, according to UPCI. While researchers used to believe caffeine was a diuretic and could thereby contribute to dehydration, caffeine in beverage form does not cause dehydration. Therefore, as long as you keep your overall caffeine intake moderate, drinking caffeinated beverages can help keep you hydrated during chemotherapy treatment. Although caffeinated drinks may help you increase your fluid intake during chemo, you may wish to avoid caffeinated beverages if they worsen your treatment side effects. 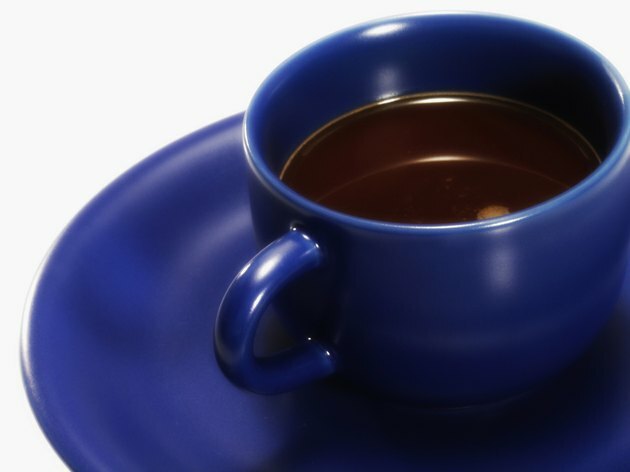 For example, according to Chemocare.com, caffeinated beverages like coffee, strong tea and soda may worsen diarrhea that occurs as a side effect of chemotherapy. The smell and taste of coffee may also be bothersome for people who have nausea or changes in taste and smell due to chemotherapy. If you have insomnia associated with chemotherapy treatment, avoid caffeine after 5 p.m., UPCI advises. If you have loss of appetite during chemotherapy, your doctor may counsel you to drink nutritious beverages such as juice or hot chocolate in between meals instead of low-calorie drinks like coffee or tea. Some research indicates caffeine may increase the therapeutic effects of chemotherapy. A study published in the September-October 2007 issue of "Anticancer Research" concluded that when administered alongside chemotherapy to patients with high-grade soft tissue sarcoma, caffeine resulted in favorable chemotherapy outcomes and increased five-year survival outcomes. A study published in the May-June 2008 issue of the same journal determined that high concentrations of caffeine enhanced the anti-tumor effects of the chemotherapy drug cisplatin in rats with bone cancer. Caffeine has exhibited antioxidant effects -- protection against the cellular damage that may play a role in cancer development -- in animal studies, including research published in "Pharmacology, Biochemistry and Behavior" in June 2011 that concluded both coffee and caffeine improved the antioxidant systems of rat brains. Further clinical research is necessary before doctors can make specific recommendations regarding caffeine and chemotherapy, however. According to the American Cancer Society, some cancer patients may have to restrict fluid intake for a medical reason and should thus limit overall fluid intake, including caffeinated beverages, per a doctor's instructions. The society also notes that you should generally limit soft drinks and other caffeinated drinks with added sugars during cancer treatment, as they may replace more nutritious beverage choices and cause weight gain, which may affect cancer outcomes. Blended coffee drinks that contain high amounts of fat may also contribute to obesity and thereby adversely affect outcomes of cancer therapy. Limit or avoid alcoholic beverages, including caffeinated drinks that also contain alcohol, during chemotherapy.